Social Networking Sites (SNS), like Facebook and Twitter, are software applications that connect people and information in spontaneous, interactive ways. While SNS can be useful and fun, they can provide adversaries, such as terrorists, spies, and criminals, with critical information needed to harm personnel or disrupt our mission. Practicing Operations Security (OPSEC) will help to recognize critical information and protect it from an adversary. It is as easy as a click of a mouse or a tap on a smartphone, and in a few seconds sensitive Army information might be shared that could get Soldiers killed. With the ease of social media, in any part of the globe, at any time, a Soldier, civilian or family member can post pictures from a deployment or talk about an Army mission. But these seemingly innocent posts could actually contain sensitive information that endangers Soldiers by revealing locations, security measures, mission operations or troop movements. 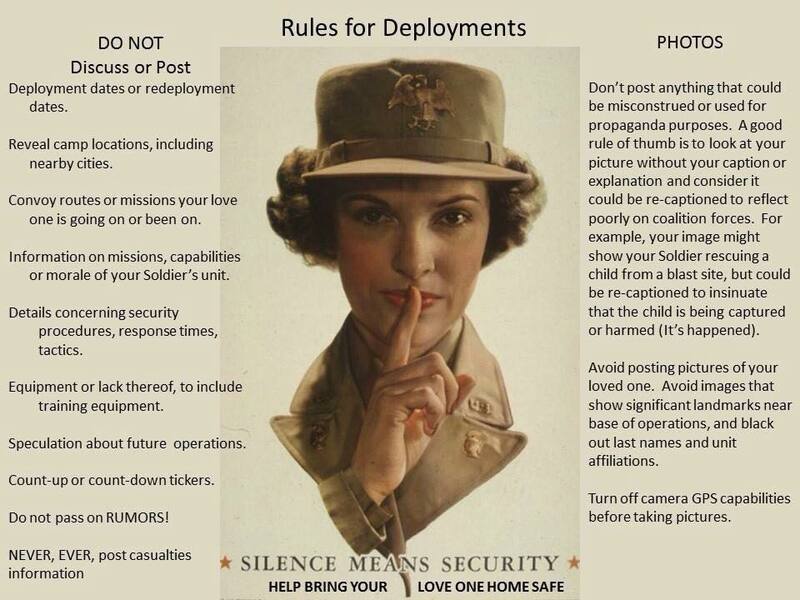 Soldiers, civilians and family members need to be mindful of what they put online, with OPSEC at the forefront of their considerations. This applies to whether the person is a Soldier or civilian communicating as an organization or as an individual on social media sites. Once information is out there, it is out there forever. Even if the post or information is deleted, if the wrong person took a screen shot, that information could become actionable intelligence we cannot get back. The information identified in the Critical Information List (CIL) is sensitive in nature as it applies to specific facts about friendly capabilities, activities, limitations, and intentions vitally sought by adversaries. Sensitive and/or critical information should NEVER be shared on social networking or Internet-based forums. Think before you post! Remember, information shared over social media could become public at any time due to hacking, configuration errors, social engineering or the business practice of selling/sharing user data.